Get the perfect mega fortress for storing hand and power tools. The Gladiator® 10-Drawer 52" Roll-Away provides the space needed to store and protect the big, the tall and the wide while offering the ability to add casters for a mobile tower of power. 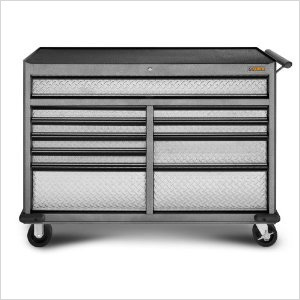 Stack the Premier Series 10-Drawer 52" Tool Chest on top for the complete, colossal tool storage experience.